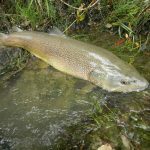 The population of this salmon-like trout is very good in Slovenia. 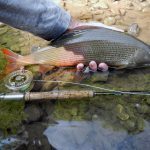 Anglers may catch them in almost every rivers and other smaller streams. Average size is around 30 cm, every year several trophy specimens up to 80 cm are frequently caught. 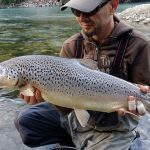 Slovenia is rich with various lakes, ponds and gravel pits that are full of large carps and grass carps. Fish usually grow up to 20 kg but every year several large specimens up to 30 kg are caught. First species is more frequent than later. Average catch is around 70 cm. 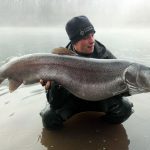 Best fisheries are Ljubljanica river, Krka river, Cerkniško jezero lake, Gradiško jezero lake, Zbilje lake and so on.